I don't think of myself as bipartisan. As a matter of fact, for the most part, I take the side against both parties. It seems to me that if the parties would get out of the way we could all be better Americans. That being said, I did vote Democrat last time. I think we've got a phenomenally astute and sensitive president this time, and I go to bed every night feeling that the country is lucky to have him in place. We are in great need of wisdom and moderation at this point. I get the feeling that most of my blog readers get a little uneasy when I talk politics. On my first blog I used to get political all the time, but it doesn't come up so much in Hoboken. For one thing, local politics here is a different animal than it was in Alabama. In Hoboken, I don't know where the bodies are buried, or who buried them (literally), and the nature of politics is very different. I observe with detachment and awareness that I'm a long way from being informed about what is really going on. I'm welcome at the city council meetings, but haven't found my way to one yet. I know we're ready for change, and was set to work for a lady name Beth Mason, a city council member who has been exploring the possibility of running for mayor, but haven't heard from her lately. On the national scene, I was overwhelmed for the whole year of the last campaign. I watched John McCain morph into a different man from the one I had supported in 2000, and Hillary Clinton emerge as a legitimate contender for the office. But the main thing I saw was the extraordinary emergence of one of the most interesting people ever to seek office in this or any country. He confounded pundits and opposition alike, who kept trying to smoke out of him the expected behavior--anger, competitiveness, pettiness--and in the face of adversity all he showed us was brilliance and grace. That he would actually win seemed too good to be true. That we would be subjected to the kind of balanced, positive, and courageous talk he gave last night just wouldn't have seemed possible a few years ago when we heard only a stumbling, inept, and seemingly lost man try to live up to the job with which he was charged. Yeah, say Obama's critics, but is he bipartisan? To that, I and apparently most of the people in my country say, he has tried to be. He included a number of tax cuts in the program he has signed through. He has made personal overtures to many members of his opposition and the response he gets is, "That isn't enough. You think we're going to consider your suggestions because you're nice to us? No way. We see through that!" Which all seems like playground bullying to me. A president can only be as bipartisan as the other party will allow. Days like this I wonder why I even bother to watch the Oscars. I managed to stay up as long as Jerry Lewis' award, and then hit the sack and by this morning it's all just a big so-what. I love movies, and I love celebrating them, but nothing they can do will make that event what it promises to be. For one thing, there is seldom any excitement. It's certainly not a surprise who will win, and when they've won there is some question what all the fuss was about. The event is rife with small awards and people making overlong, uninteresting speeches. A lot of self-congratulation for not very much. The same guys getting up time and again and trying to think of different things to say and do every time. I admire Hugh Jackman. That guy is a huge talent, a show of his own. But this time they gave him center stage and seemed to tell him not to do much with it. If given free rein the whole event would have become The Hugh Jackman Show, and a much more exciting one at that. His little turn with Anne Hathaway at the beginning was charming (and what a surprise that she has a voice and a flair for the musical-comedy realm), and the "Puttin' on My Top Hat" number with Beyoncé almost worked, except for the fact that it made no sense whatever. The moves kept veering from Fred Astaire musical to recent Broadway and cinema--the lyrics complicated matters with occasional references to a current or former movie. Calling Beyoncé "Maria" was confusing and uncalled for. Was this the 2008 Oscars or a tribute to every musical movie ever made? Why? The interminable awards to unknowns for technical achievements are of no interest to the television audience. It's their "big night," maybe, but I'm just a schlub sitting on the couch hoping to see something that makes me laugh or warms my heart. No chance the hours of waiting for a gem amid this noise and clatter will provide what I was hoping for. The award to Jerry Lewis didn't show us any of his best work, clips of which would have livened things up and showed some of the people under 40 in that crowd exactly what it is that makes us regard him as an American original, a world-class clown, the antecedent of Robin Williams and Jim Carrey. Lewis himself seemed sedated and weary. So was I, man. I went to bed. Maybe next year? Oscars don't mean much. They may not mean anything. That is not to say I don't enjoy my own, which wasn't an Oscar at all, but a going-away gift when I announced I would be leaving Geneva after one last bang-up production in the amateur company I had founded in the early 1980s, The Little Theater of Geneva. I played Evy in The Gingerbread Lady, had a lot of laughs at at the going-away party, and was off for a new life in the States. The "Oscar" says at its base, To Mary Lois Adshead/From your own creation/The Little Theater of Geneva/1981- The date of demise is left blank, in the unstated hope that the group would continue forever, but as I understand it disbanded after about ten years. The presentations of the awards for the Motion Picture Academy of Arts and Sciences almost always promise a good show, and sometimes deliver. I loved Billy Crystal as host, and look forward to seeing what Hugh Jackman does. Jon Stewart was a bit out of place, but managed to entertain. I even saw the presentation when Rob Lowe danced and sang with Snow White (yecch) and when Sammy Davis, presenting, was not given the envelope he asked for, and brought down the house with, "Ya gave me the wrong envelope??? Wait'll the NAACP hears about this!" I was living in Alabama at the time, and the line was a huge hit in the neighborhood. The best host of the event will always be Bob Hope, who owned the show for 18 years. Smooth and slick, he always managed to sound spontaneous even though he had the best writers in the biz at the time. His running gag was that he expected to win a statuette, and would occasionally try to wrest one from a winner. On the first year he was replaced, he came breezing onstage in white tie and tails some hour into the proceedings and announced that he was sorry he was late--he had been told the event was in another location! Nobody really cares who wins an Oscar, except perhaps the occasional tearful recipient. Not that many of us have seen the films, besides, how can we say which performance is "best"? Makes no sense. Audiences like the show because it is a glimpse of live television and something just may go wrong, or at least not as written, not as predicted. This year the only surprise for certain will be the winner of the Best Supporting Actress award. I would not venture to say who it will be among the following: Amy Adams in Doubt,Penélope Cruz in Vicky Cristina Barcelona, Viola Davis in Doubt, Taraji P. Henson in The Curious Case of Benjamin Button, or Marisa Tomei in The Wrestler. As it happens I've seen 'em all except The Wrestler, which it would take a very powerful team of wrestlers to drag me to see. My guess is that the statue will go to Viola Davis. Every one of the actresses I saw was flawless, moving and excellent, and I have no doubt that Marisa Tomei was too (but she has one; this is not her turn). I think Doubt was a fine little film with four outstanding performances, but hers will probably bring home the gold. If I were voting, I'd give my ballot to Penelope Cruz, no, maybe I would give it to Miss Davis. Who knows? I'd like to see either of them get it. I'd like to see somebody in Benjamin Button get one, but I'm not expecting it, except maybe for Art Direction, Costumes, or Musical Score. Pitt and Blanchett were awesome, the movie was breathtaking, but they are not going to win the statue. You see, it's about something else. It's about moneymaking, the commerce of movies, the ability of the industry to congratulate itself for its artistic merit while rewarding its achievers in the area of ticket sales. It's about sizzle at the same time that it's about steak. It's not very important, but it means everything. And it's usually a hell of a good show. I'll be at the tv Sunday night until, if true to form, I fall asleep at the set. Again, not very important--I'll learn the big winners the next day. I've had a spotty history with the medical profession in Hoboken. When I first arrived I began looking for a primary caregiver, as they say in today's medical parlance. I found a nice modern clinic in a good location near the PATH train, with a lab in the same building, a pleasant young female physician who happened to be Indian, and she recommended an array of specialists to help with with the various functions I would have to have checked over the next year. I had the colonoscopy she recommended, the physical therapy she prescribed for a frozen shoulder, the routine gyn exam, and sought her out for my followup appointment. Couldn't find her. I tried the Internet but only found her name in some old records of medical meetings she had participated in a few years ago. Went to the modern clinic and found its doors closed. Before the end of the year I was able to find her name associated with a clinic in North Bergen, so I found her there. She told me the hair-raising story of the Hoboken clinic; one of its lead doctors had had a nervous breakdown and closed the place down in one fell swoop. Lawsuits were still being waged by the principals, but, as a paid employe she was required to find work elsewhere. She would soon be leaving the Bergen place for her practice in Manhattan. In the meantime, all of the doctors she recommended to me had left Hoboken. I went to one who had been recommended by one of my old-Hoboken friends, and we had a nice meeting last week. He prescribed a routine blood screening and said the hospital would do it on a walk-in basis, but I'd have to be fasting. Having had this done in the past, I decided to go first thing this morning. I just got back, but there was a little adventure involved. The hospital is a nice walk from my apartment on Willow Street, and the weather was fine for it. I had my prescription and all my insurance cards. When I got to the admissions desk, the admitting agent rejected me on the basis that the hospital does not do routine screenings. I asked who did and she said she didn't know. "Maybe one of those clinics," was her only recommendation. I walked out hungry and disappointed, thinking sometimes it's no fun living in a small town. Then I began to devise a plan. I'd call my doctor when his office opened at 12:30 and tell them I needed to find a clinic that did routine screenings. By now I was at the corner of Willow and Sixth and I saw a sign on a door that said, "Medical Laboratory." It was open, there was a nice nursey person behind a desk, and when I told her my problem she said, "We can do that. All we need is your prescription and your insurance papers." It turns out "we" was just her, and she did the work for me in five minutes. I left feeling very happy, bought myself an orange juice at the corner grocery at Willow and 9th, and came home to write of my first adventure of the day. Now to rustle up some breakfast! Everybody has a day off today. I know, because they were all at the gym this morning and I couldn't get a machine. Really. This place probably has about 900 machines of all types and every one of them had a sleek young body working out on it. I decided not to wait but to try again tomorrow. After all, at my age I'm in this for my health and one day is not going to make all that much difference. The athletic young stars of the financial markets were out in force all over town--jogging in and out of Starbucks and Dunkin' Donuts, whipping through the parks, the boutiques, the lunch places, and just wait until 5 P.M. when the bars will fill up. I have a day off every day. I make my own coffee, usually, and eat very little at restaurants ("Why do you live in Hoboken?" you are asking), and avoid the bars. I have carved out a life with none of those things and my time is my own. I just got Christopher Plummer's autobiography (In Spite of Myself) out of the library and am having a great time with that. 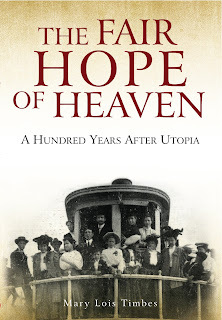 Not so interesting as The Fair Hope of Heaven, but a good read. There is truly no such things as a day off. I just got back from the A&P. I have read the New York Times online, and checked the usual blogs including Hoboken Now and Hoboken 411. Before the day is over I have to make appointments for medical checkups, and order some new movies from Netflix, and see if Dr. Phil or Oprah have anything gripping on their programs. I have the day off, but as you can see, life is a veritable cornucopia of responsibilities. I keep getting emails from Barack Obama, and I must attend to them at once. That election was about me. And then there's the writing of the blog. And the checking on amazon.com to see if any of you are ordering the book. And tomorrow I must go to the gym. There was good news and bad news at the A&P. The bad news is that they've stopped making wax paper. It's still available in the house brand, but Cut-Rite has disappeared from the shelves (not only at the A&P, but also at Rite-Aid and CVS). Soon I think there will be no such thing as wax paper. The good news is that you can get Irish Soda Bread already. St. Patrick's day is a month from tomorrow. Corned beef, cabbage, and potatoes cannot be far behind. It was a valentine party at the Symposia Bookstore. Why it was held on Lincoln's birthday, I'm not sure, but the owners of the Symposia are from Roumania or Bulgaria or somewhere so they chose the day. I met them at a little dinner party at Cristina's last spring. It was wonderful, like being at dinner in Geneva once again--everybody at the table except for Cristina's husband Ron (from Pennsylvania) and me spoke perfect English with a trace of an accent from somewhere, and we talked of grand topics and not just local things or shopping. I had liked the couple enormously, and had already frequented their bookstore, which is right in the middle of town on "the avenue"--Washington Street. Valentine's party guests were asked to bring a dish and a favorite love poem. On my Shameless Self-Promotion Tour, I decided to read a poem that appears in my new book The Fair Hope of Heaven, "The Chain I Wear for You," by Gretchen Riggs, my old theatre mentor. I didn't know the party would entail a full meal, so I ate before leaving home, but brought crackers and a dip made of tunafish and beans. It may not sound good, but it is. I was met at the door by a very aggressive and pleasant young man who, if I didn't know better, I would have thought was rushing me. It wasn't long before I learned that he works at the store. He was being professional, keeping the party moving, talking with everybody. A beautiful old lady, Antonella--in a red sweater with a black feather boa was already holding court, talking of Italy and how wonderful it is to be Italian. She was thrilled that I had lived for six years in Geneva, although she had never been there. She was enthralled in what looked to be a lifelong argument with her table neighbor, a lady who looked like Gilda Radner and who had traveled Europe with her. When Gilda said, "Is there meat in this? I don't eat meat", it set Antonella off--"You don't eat meat, you don't eat anything, all over Europe you complain about the food. I am Italian and I love to eat!" I said to Nancy, bouncy-haired and smart, and sitting on my right, "That must have been a wonderful trip," and they two of them said it had been a wonderful trip all right. Gilda said she never complained about food. The place filled up. The tabled groaned. Everybody was noisy and having a good time. Ron came in and said Cristina was coming in the car and would call him on his cell phone if she couldn't find a parking space. The time came to read the poems. Nancy started off by reading something by Anthony de Mello on the meaning of love. De Mello I knew from the old 12-Step Sunday meetings led by the wonderful Paul Sheldon in Alabama. Nancy's choice stated that love must be based on first really knowing the object of one's love and accepting his or her reality. All other love is self-love. Carmen asked who had the nerve to follow that one. Gilda had a beautiful ancient Egyptian poem by a man whose wife (his "sister," she told us, was the way the ancients put it) had left to join the gods seven days before. Then it was time for me and Gretchen's poem. I held up the book, described Gretchen, read the poem and the paragraph that follows it. I don't know how it went over. People were quiet. They were listening. It wasn't too long. But as far as self-promotion goes, nobody asked where they could buy the book. But I'll bet they are thinking about it. Just as I am thinking this morning about what a grand little party it was, what a pleasant tribe. Cristina and Ron drove me home, and as we got into the car, she said to me, "I knew you'd like those people." It is fitting for today’s world when so much has gone awry that we take a moment to look at lives of purpose, of promise, and of wisdom. In times such as these, this inauspicious little book, based on experiences in an obscure town in South Alabama, is the one you should reach for. It will transport you to a period of hope and a place of experimentation. It may well be just what you and the rest of America needs. Daniel Spiro, Washington, D.C. attorney and author of The Creed Room and Moses The Heretic, writes: “Some dreams are realistic, some are utopian. I would almost put in the latter category my dream of someday writing a book with the exquisite timing of this one. One day, we find ourselves living in the very prototype of an advanced capitalist society; a few months later, Newsweek adorns its cover with the inscription, 'We Are All Socialists Now.' Or are we? When you read Mary Lois Timbes' newest work on Fairhope, Alabama, you might not use the word 'socialist' quite so glibly. This is a charming, breezy read about a town founded roughly a century ago on the belief in the idea of Henry George, who argued that land is the only commodity that should be taxed at all, and all citizens should share equitably in the fruits of those taxes. But ... as Ms. Timbes tell us, Fairhope was not socialist. It was, in fact, the model of an individualistic society in the sense of celebrating the diversity and accepting the eccentricities of its residents - the kind of characters who typically would be ostracized in small towns and lost in big ones. It is essential to my success as a writer that both amazon.com and Barnes & Noble.com get numerous orders for the book before the end of February. If you never buy another book, or even read one, go to either of these websites immediately and order a copy. Now is the time for readers of Finding Myself in Hoboken to take that next step and buy a book by its writer. Too small for a doorstop, the book may serve any number of other purposes. It will make a wonderful gift to someone who admires people with extraordinary lives. Reading is good for you. It's not fattening. It will make you feel good, even if you never heard of Fairhope, Alabama, and didn't know you would want to. You want to now. Do it. Then let me know what you think. Having the kind of brain that retains vivid memories long after they've outlived their usefulness, I am drawn to ponder them, call them up once more, examine them and bore the pants off people who have no interest in them and can't even remember the events ever happened. In some ways this is a liability. In some ways it might be an advantage. I have written two books that were helped enormously by having a sharp memory. I love stories of the old days. My curiosity about history has caused me to write many a blog post about old Hoboken, and some of those stories have helped me build quite a large readership here and helped me make more than a few wonderful friends in a place I've lived just over a year. There may even be a book about old Hoboken hatching somewhere in my lizard brain. A few months ago I was contacted by a man I'd known in 1971 and hadn't even thought of since. He saw a television commercial with an actress who reminded him of me in 1971 and looked me up on the Internet. Likewise, I saw the blog had a visitor from Seattle and knew only one person that might be, so I looked him up on the Internet and got in touch with him. (In the latter case, he hadn't been the blog visitor, but he did remember me and told me he'd take me to lunch next time he came East.) The first man was another who needs to touch the past, as I do; he has told me he is still in touch with people he was in college with in the 1960s. I have four women I went to grammar school with that I still have lunch with when back at home in Lower Alabama. We talk about teachers we had, and what the town was like, and then we look at pictures of each others' grandchildren. I used to think that was a little pathetic, but now I simply think it's a connection, a natural way to touch the past. The blog post about my employment at Fairchild Publications brought any number of contacts from people in touch with that part of our shared past, and numerous comments with stories of situations and people they remembered. Mort Gordon emailed me that he appreciated the mention, and that I should write a book! There you go--another book. This one about Fairchild Publications in the 1960s and 70s. I try not to live in the past. It's a trap when your mind surrounds you with the world as you once knew it--and the danger of just staying there increases with every year of jarring and often disgusting change. But touching the past, ever so gently, is more than a pleasant experience. It enriches life and can offer all kinds of new adventures with old friend, or repeat adventures with new friends. The trick is in knowing how to play it. I don't know if I've got the knack of it yet, but I'm on the way. I had rented three movies that I wanted to see. Haven't found Bottle Shock yet, but I'll tell you more about that one later. I have an account at Blockbuster, which is about ten blocks from my apartment, to say nothing of the trip down four flights of stairs as I set out and four flights up upon return. Friends have urged me to switch to Netflix, but for years I've defended the concept of browsing in the stacks and looking at the covers of the DVD's in order to make my decision. I used to check the cover for "Two Thumbs Up!" but those days are over. Now I have to make my decision based upon the actors and a general feeling for the mood of the film as portrayed by the picture and title. I cannot bear to see much of the actual film--as in the eternal clips and previews on tv--or to know its plot line before watching. Marshall. I have a friend who occasionally reads the blog and is even more of a fanatic about not knowing anything about a movie he's going to see before watching. This review is for him, with the promise of no plot-spoilers. Recount, made for HBO audiences, is already spoiled for everyone on the planet who was even vaguely alert eight years ago during the first election of George W. Bush to the presidency. It gives behind-the-scenes details that we might never have known, and is a very good, compelling little film, except I kept saying to myself, "I know how this is going to come out. And it won't be good." So the film spoils itself just by being. But the performances are wonderful and some of the scenes are just delightful. I have been watching the awards shows with detached interest. I never care a whit who wins what, but as an inveterate movie addict, I just gotta know who's in the running. And, although I seldom agree, I can usually dope out who will win in which category even if I haven't seen the film. The title In Bruges kept cropping up, but I had no idea what it was, except that the marvelous Colin Farrell was in it, and the film has been nominated in several categories in the Golden Globes. The only category it made for an Academy Award, I believe, was Best Screenplay. Odd how a Best Screenplay would not produce a Best Picture, but that's often the case. I rented In Bruges and laughed from beginning to end. Not that it's a knee-slapper. The laughs are dark as the film is dark. The situations are ominous and the characters untrustworthy. You really don't know what is going to become of them. They are doing terrible things. But then they'll say something funny. And they become real, multi-dimensional. They are wise one minute, stupid the next, evil one minute, soft-hearted the next. It is a beautiful little movie, but serious and somber, at the same time you're laughing at it. I just said I laughed from beginning to end. That's not quite true. At the end, I wasn't laughing. I just hadn't forgotten how much fun I'd had on the trip. The third film was the biggest surprise to me. I knew absolutely nothing about Forgetting Sarah Marshall except that I'd seen that it had been liked by a couple of critics. (Siskel and Ebert, where are your thumbs when I need them?) I knew it was made by one of the new breed in Hollywood, produced by Judd Apatow, who was responsible for Knocked Up and The 40-Year-Old Virgin, both of which I liked somewhat. You might call Forgetting Sarah Marshall a romantic comedy, or a comedy of romantic blunders. It stars Jason Segel, who wrote the script and comes over on film as the next Brendan Frasier, big and attractive and bumbling. It has an intricate plot and a lot of great comic turns, notably Russell Brand as the English rock'n'roll singer with a bizarre philosophical outlook. One really outrageous character, the blonde and brain-frozen surfing teacher, kept reminding me of Paul Rudd--until I discovered it was Paul Rudd. Let's just say I really enjoyed Forgetting Sarah Marshall, and am now a fan of both Judd Apatow and Jason Segel. With the onset of winter, I'm going to subscribe to Netflix and I'll do fine figuring out what to order. They may even have Bottle Shock. Saturday afternoon the odd little bell-chime sounded telling me I had a text message on what I laughingly call my cell phone. Averse to the world of touchtone maps, cameras, video games, iTunes and Internet access, a year ago I purchased a phone that only received and sent phone calls. I thought. When my brother went into the hospital in Houston for bypass surgery, his wife, who is also my friend, kept sending me text messages, which hopelessly I could not for the life of me figure out how to respond to. I left messages on her answering machine, "Do not send me text messages. I don't know how to receive or send them." Trapped in the hospital lobby with nothing to do, she kept sending them anyway. Then when I moved to the new apartment, I had to find a tenant in order to get out of my lease. The tenant was in her early 20's, not allowed to make phone calls at work, so she texted me the details of the move. She even showed me the basics of how to use the text feature of my phone. I kinda wish she hadn't, but never mind. We all have to go along with this stuff to some degree. So when I heard the bell tune on my phone I knew what it was, and with a vague sense of dread check it out. It said, "Hey, I got your number from a friend of mine, but I bet you can't guess who I am! My username's gizmo 398, if you"
Then it rang again. The message continued "wanna come see if you recognize me online, at gizmo 398..." and gave a web address. With some struggle I replied "I dnot think so." Of course I was trying to say "I don't think so," but my phone didn't want to get it right. Only if you've tried to send a text message will you understand why it came out that way. Finally, I decided to send it with the error since any fool could figure out that "dnot" is "don't" written by a text-illiterate. However, I admit I was intrigued. I felt like a total fuddy-duddy expecting anybody who had my number simply to call me to talk. If it were somebody who wanted to meet me, I reckoned, why would the person not simply begin by calling me on the phone, telling me who the mutual friend was, and we could arrange a time and place to meet and have an actual talk. Also, being someone called gizmo 398, this did not sound like a person I was going to have a meaningful relationship with. Call me rigid. Call me frigid. But don't call me, gizmo. I went to the web address and discovered it was one of those "make a friend" type sites for which you have to register all your personal data even to get on. I did not want these creeps to have my personal data. If they want to know about me, they can read my blog, on which I lay bare my quirks, foibles, and even my age. I've gotten three invitations to join Facebook in the last month, and I always pass. I wonder who gizmo is. But I'll bet whoever it was had reached the wrong cell phone.